I’ve said it before, and I’ll say it again: it’s too hot to do any serious cooking or baking. Hence summertime seems prime for raw food recipes. When I got a waitressing job at the fancy raw food restaurant, I promised to share a few raw food recipes on the blog. 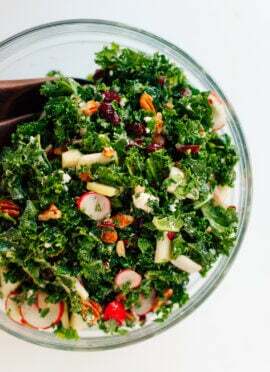 I came up with the concept for this salad on my own; it’s inspired by a different raw kale salad at work, and some other salads I’ve enjoyed elsewhere. The basic premise behind the raw food movement is that the enzymes naturally present in raw fruits, vegetables and sprouted grains start breaking down when they’re heated above 105 to 118 degrees Fahrenheit. Those enzymes help our bodies digest food; when we kill them off, our bodies have to make the enzymes, which consumes energy and is basically unnecessary and counterproductive. Some vitamins tend to lose their potency when exposed to high temperatures as well. Basically, the raw food movement’s goal is to retain all the inherent goodness present in food in its original form. I’ve always been a fan of raw and cooked vegetables and fruit, but only recently started thinking more about how cooking affects the nutrition content of food. I’m certainly not vegan, though, and I’ll never give up baked whole grain bread, or my favorite cold weather soups. I also know that heating some produce, like tomatoes and sweet potatoes, actually enhances their nutrition profiles. While I’ll never be a raw food purist, there’s no denying the health benefits of eating fresh, raw fruits and veggies. 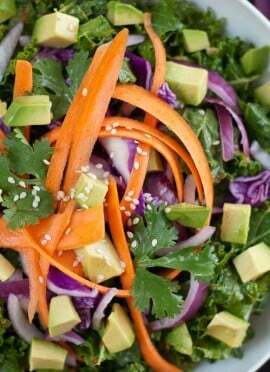 This salad is an example of how delicious raw food can be. It’s so filling and flavorful, you don’t even have to know about raw food to appreciate it. It’s just good. 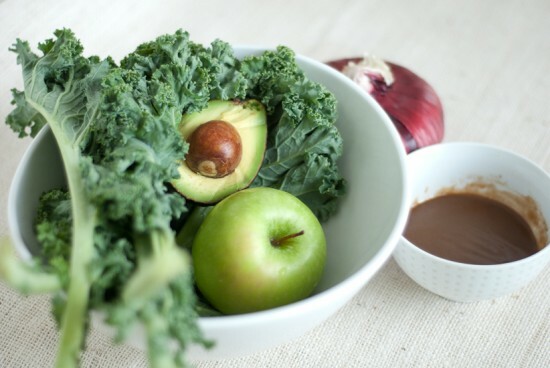 Raw kale salad with green apple, avocado and red onion, tossed with a tangy balsamic vinaigrette dressing. Pull the kale leaves off from the tough stem, and break into small, bite sized pieces. Sprinkle with salt, and massage the leaves for a couple of minutes, meaning that you should scrunch handfulls of kale in your palms, release, and repeat. The kale will become darker in color and more fragrant. 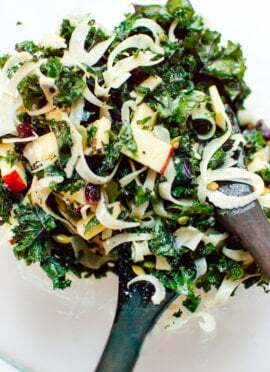 This step makes the raw kale tastier. 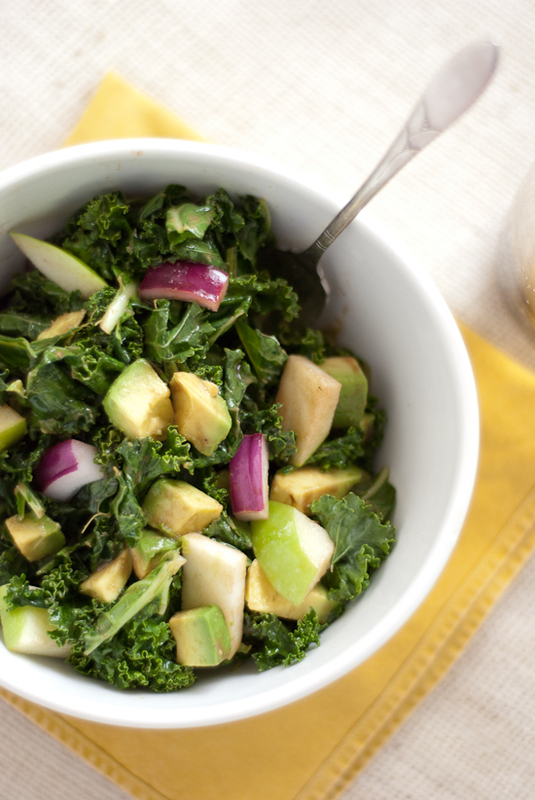 Throw the kale into a bowl, drizzle with the salad dressing, and mix thoroughly. Toss in the avocado, apple and red onion. Salad dressing adapted from The Raw Difference. Salad ingredients listed above yield one big salad. You may have leftover dressing, just save it an airtight container for later. Beautiful pics! Can’t wait for the raw dessert posts! 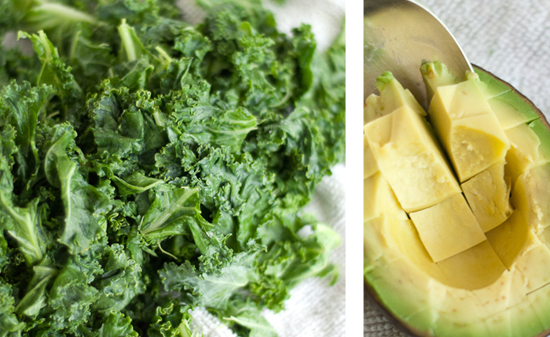 Oooh so delicious and healthy! Love it, it’s going to be one of my lunches these hot days! 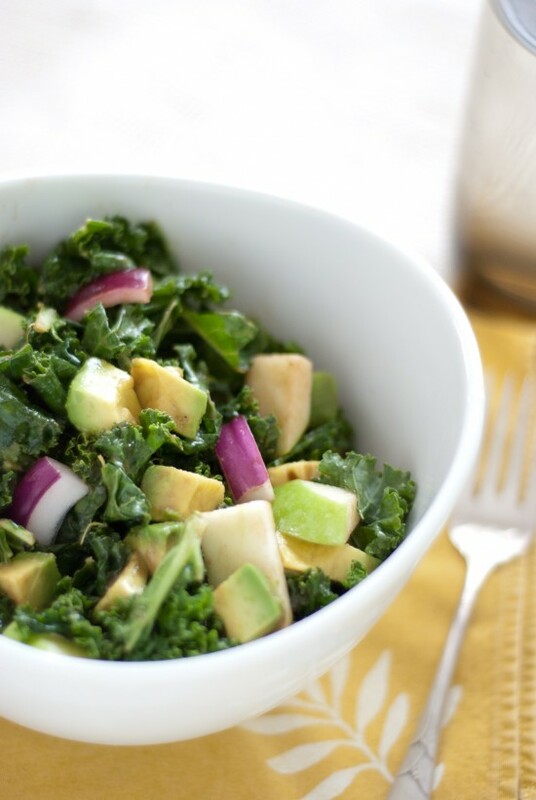 This salad is health in a bowl! Love this! Oh yes, I am totally with you. And I never tire of salads like this. this salad is amazing! love it. Thank you. and I’m happy to have stumbled upon your blog. what a find! such pretty pictures and good food. why have I not seen it around? Thanks! Glad you found my blog, Becca! Thank you, Martin! So happy to hear that you’re enjoying my recipes. I appreciate your feedback! This was so good. I am in love with your blog. I recently saw your butternut squash recipe on “The Chew” and I have been hooked ever since! You are doing a great job! I have never been so excited about raw veggies or black beans. I have a 1 year and I don’t have a lot of time to experiment, but your recipes encourage me to find the time. Again, I can’t thank you enough for sharing your passion for food! Kelly, thank you! I’m glad you found my blog through The Chew. That was a fiasco! So happy to hear that you’re enjoying my recipes! All my best to you and your family! Your recipes are great, but I never see what the nutritional info is in the recipes.